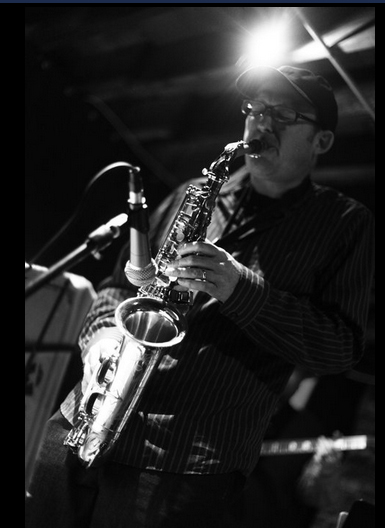 Composer/saxophonist Kevin Pike is known for his eclectic musical output. He has released over 15 albums, performs in a free jazz duo and other groups in Omaha. He publishes the DIY recording podcast “Look What I Made“. 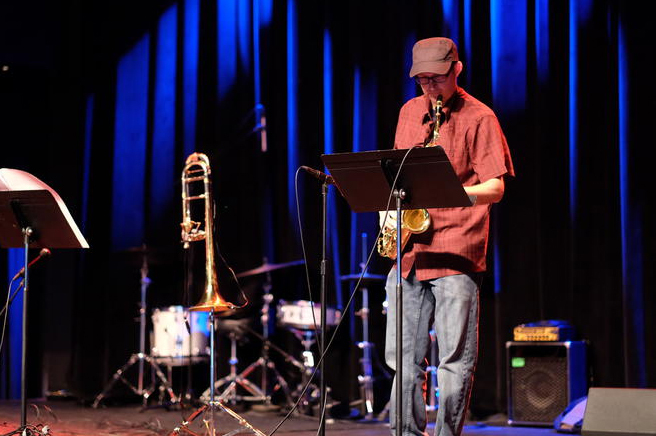 Kevin has a Jazz Studies degree from DePaul University where he also studied composition with George Flynn, Jeff Kowalkowski and Cliff Colnot. When Kevin Pike formed his band in Omaha in the early 2000’s, a band that included himself and bassist/drummer John Kotchian, no one knew what to expect. But listeners have left their performances floored, and there is ample documentation of the magic those two create. 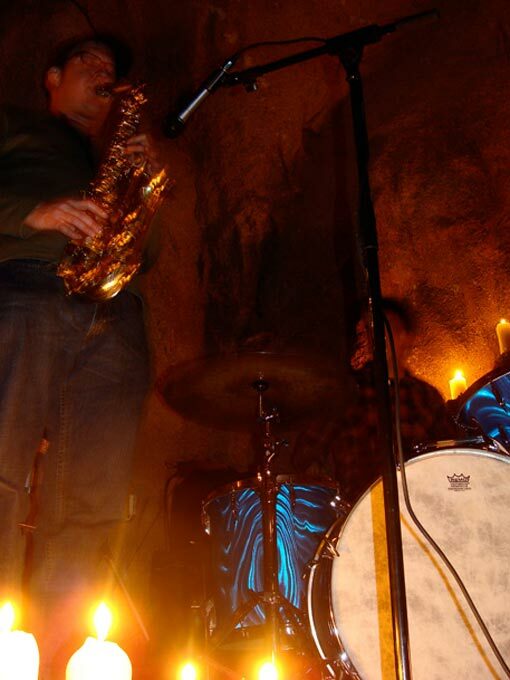 Pike’s unique sax playing always sounds voicelike, undeniably sophisticated, rich and accessible. His interplay with Kotchian is remarkable: raucous arpeggios surrounded by extensive contours that spar with the drumming as Kotchian crosses hands, chops and undulates the time. Pike’s solos are demonstrative of his melodic gift: his improvisation skirts the edges of free jazz masters, but his own sense of the deep wellspring of song and the cross-pollination of various world musics keeps him busy and lyrical. Within the duo, it’s not so much communication as telepathy! Pike’s angular solos are buoyed up by Kotchian’s seamless force. My husband and I have been admirers of Kevin and his wife, playwright Ellen Struve, since we met them, early in their Omaha tenure, over 10 years ago. We’ve had the pleasure of playing with Kevin in various situations. Here Kevin joins bassist Mark Luebbe, my husband alto player Steve Thornburg, and myself, on a loose version of Rahsaan Roland Kirk’s Seranade To a Cuckoo, live at Side Door Lounge, Omaha, a few months back. Kevin always brings the heat, and is one of the easiest going & pleasant people you’ll ever work with. I file the name Kevin Pike under: “Artists Worthy of Wider Recognition”. Kevin answered his FIVE QUESTIONS via email. 1) What are your earliest recollections of music? Was saxophone your first instrument? How did you acquire your first instrument? Who were those early teachers who gave their time to you? KP – When I was little, my grandfather had this tape recorder that he used to follow me around with and record our conversations. It got me into making tape recordings, which continued on as I got into music. Alto saxophone was my first instrument, and is still my main axe. I had a great Middle School band director, Kay Niemasik, who really fostered my musical development. 2) Who are a few of the artists you admire and why? At what age were you exposed to your favorites? Are there artists out there doing what you’d like to do or is yours a singular vision? KP – I admire artists that continually seek out new territory, whether it’s cross-genre, conceptual, or compositional. Artists such as Wayne Shorter, Vijay Ayer and Mike Marshall. I see music as a pursuit, a moving target that is constantly evolving. I was exposed to a lot of different music at DePaul University. There was a real emphasis on modern music and crafting your own sound, which I think was a direct result of being in a big city like Chicago. I got a sense from living there that you have to carve out your own path for what you want to accomplish musically, and that it’s different for every artist. My approach has stayed the same in the 10 years that I’ve lived in Omaha too. 3) What are your inspirations for your art? How do you go about your creative process? Is it an everyday thing? How did you develop your free style? KP – I get ideas all the time for new compositions and recordings. I file them away until I have time to work on them. I usually record late at night after my kids have gone to bed, then listen to the result outside of my studio (on my ipod or in my car). This separation gives me clarity on what needs to be added or reworked the next time I’m back in my studio. As for my approach to playing saxophone, I think that all the experimentation and recording in different genres I’ve done over the years has really seeped into my sound when I play live. 4) Speak about your radio stations and your website for a moment. How do you approach what you release to the world via your website? KP – These days, I pretty much post everything I record on my website after I’ve finished it. I’ve been using youtube a lot lately because it’s about the easiest way for people to listen to something. My attitude on posting stuff is it gives you closure and allows you to move on to your next idea. If I’m satisfied with the results, then I’ll put it out there for people to stumble upon or seek out. KP – I’ve got 2 recording projects I’m working on right now that I’m really excited about. One is a collaboration with drummer/bassist John Kotchian and multi-instrumentalist David Seay. We’re experimenting with unusual instrument pairings in a free jazz context, including hurdy gurdy, musical saw, yak horn, sax, drums and bass. The other project is an album of my own I plan to release in 2015 called “The Sound of Things”. It’s a collection of contemporary compositions that put common sounds into a musical context. I’ve been experimenting with how sounds like soda fizz, cat meows, water faucets and industrial equipment can be accompanied by traditional instruments like saxophone, banjo, melodica, harmonica and percussion. My long term goals are the same as my short term ones – keep composing, playing and recording and see what music comes out of it.